The recent buzz in skin care has taken a strong shift toward indoor lights—lightbulbs and computer screens—and how it might be quietly ruining your skin. You already know that staying out of the sun and wearing a broad-spectrum sunscreen are the gold standards for protecting skin from wrinkle- and spot-causing UV rays. But experts are asking if the light we’re exposed to while scrolling Instagram, watching a movie, or reading under a lamp is similar to what we get on the beach. New studies on the potential hazards of infrared, along with the blue glow emitted from our device screens and light bulbs, show that exposure really may lead to skin damage and accelerated aging. “There is controversial data suggesting that various forms of indoor light may actually be harmful to the skin,” explains Joshua Zeichner, a New York City dermatologist. (Yikes! Are we not safe anywhere?!) Below, we break down the different forms of indoor light, their harm potential, and a new generation of sunscreens that promise to save us all. IS INDOOR LIGHT AGING YOU? HEV or high-energy visible light is the blue glow you see emanating from your smartphone, tablet, computer, or television screen. The issue, dermatologists say, is that HEV exposure can speed up the aging process, leaving us with premature wrinkling and dark spots. (Note: HEV is not associated with the development of skin cancer.) The good news, Zeichner says, is the amount of HEV shed from our gadgets is most likely minimal, making it unlikely that a few emails are going to wreak havoc on your complexion. In fact, it would take 13 hours in front of a computer screen to equal the amount of HEV that is generated by the sun in 15 minutes. So what can you do to protect your skin from HEV and IR wavelengths? A fresh crop of sunscreens emerging on the shelves promise to shield against them with a variety of antioxidants. 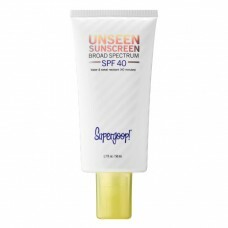 The new Unseen Sunscreen SPF 40 by SuperGoop contains the typical chemical filters: Avobenzone, Homosalate, Octinoxate, and Octisalate, along with antioxidants red algae and frankincense. According to Sofia Gracia, SuperGoop’s director of product development, red algae works by absorbing and neutralizing blue light while also helping to protect against infrared radiation. Frankincense was chosen for its anti-inflammatory actions, she says: “When applied topically, it reduces the severity of reddening induced by IR radiation.” Coola’s Sun Silk Drops are blended with knotgrass extract, an antioxidant which the company claims helps ward off infrared rays, Liposhield HEV Melanin alleges to protect against the effects of HEV, and jasminum sambac leaf cell extract and mangosteen are included to shield skin from ultraviolet, infrared, and blue light. 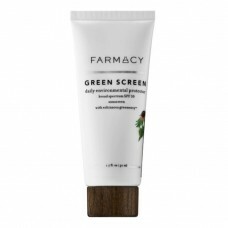 Farmacy Green Screen SPF 30 is made from mineral actives titanium dioxide and zinc oxide and boosted with chokeberry and marigold extracts. The company declined to comment on their formulation for this story. Photo: Shot on site at 6 Columbus, a Sixty Hotel. On Solveig: Pajamas, Morgan Lane; Bra, Fleur du Mal; Bra, Fleur du Mal; Underwear, Fleur du Mal; Rings, Azlee, Baker & Black.